JNN 19 Mar 2014 MOSCOW — Russian President Vladimir Putin and leaders of Crimea signed a treaty on Tuesday accepting the Republic of Crimea and the city of Sevastopol as part of the Russian territory. The deal, signed during a ceremony at the Kremlin attended by lawmakers,still needs to be ratified by the Federation Council, or upper house of the parliament before it comes into effect. Russia set the deadline for a transitional period of Crimea’s integration into Russia until Jan. 1, 2015. During this period, Crimea’s integration into the economic, financial, credit and legal systems of Russia and the military service on territories of the Republic of Crimea and the city of Sevastopol will be settled, according to Russian laws. As for Sunday’s referendum during which an overwhelming majority of Crimeans voted to join Russia, Putin said Crimea acted under the UN Chapter which declares the right of a nation for self-determination. Russia could not leave Crimea and its people alone in bad times, otherwise it would be a “treason,” he added. 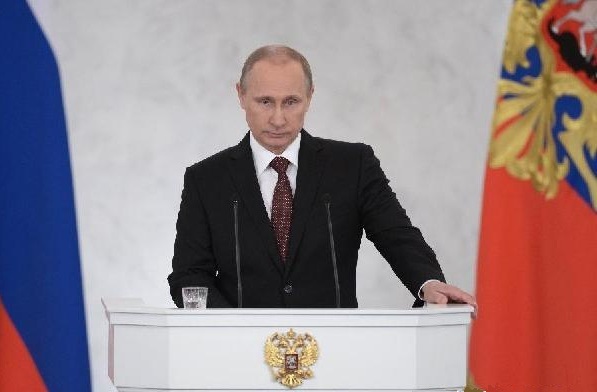 Putin noted there were no clashed happened in Crimea because it was impossible to fight against people’s will. Meanwhile, the Russian leader called situation in Ukraine a mirror of what happened in the world after the collapse of the bi-polar system. He blamed the U.S. exceptionalism and its use of forces against sovereign states ignoring the UN and the UN Security Council. “They brought no democracy and freedom but chaos and violence … We were cheated repeatedly by the West,” he concluded. Russian President Vladimir Putin accused the United States on Monday of being guided in its foreign policy not by international law but by the “rule of the gun” in a televised address to the nation. Speaking before parliament, Putin said the rights of ethnic Russians had been abused by the new Ukrainian government. He insisted that Crimea’s vote Sunday to join Russia was in line with international law and reflected its right for self-determination. “Our Western partners headed by the United States prefer not to be guided by international law in their practical policies, but by the rule of the gun,” he said. Fiercely defending Russia’s move to annex Crimea, President Vladimir Putin said Russia had to respond to what he described as a Western plot to take Ukraine into its sphere of influence. Putin’s speech came just hours after he approved a draft bill for the annexation of Crimea, a key move in a flurry of steps to formally take over the Black Sea peninsula. This entry was posted in Europe and tagged Crimea, Republic of Crimea, Russia, Russian President, russian president vladimir putin, Sevastapol, Ukraine, Valadmir Putin. Bookmark the permalink.